Zaycon has opened up ordering for this year and if you’re interested, order before they sell out! The price is $1.85/lb, which is a stellar price on boneless, skinless chicken breasts! This chicken is 100% natural chicken with no added hormones, additives or artificial ingredients. Sign up here to view the dates and locations. (This sign up does not tie you to order anything) If you’re in Maryland, you should be able to find a pick up location in your area. They just opened up the order form for local orders! You’ll want to order as soon as possible because they do sell out! You purchase a case (or more) 40 lbs of raw boneless chicken breasts for a very low price. You can split orders with friends and family as well. If you haven’t heard of Zaycon, or need more info, please read here! 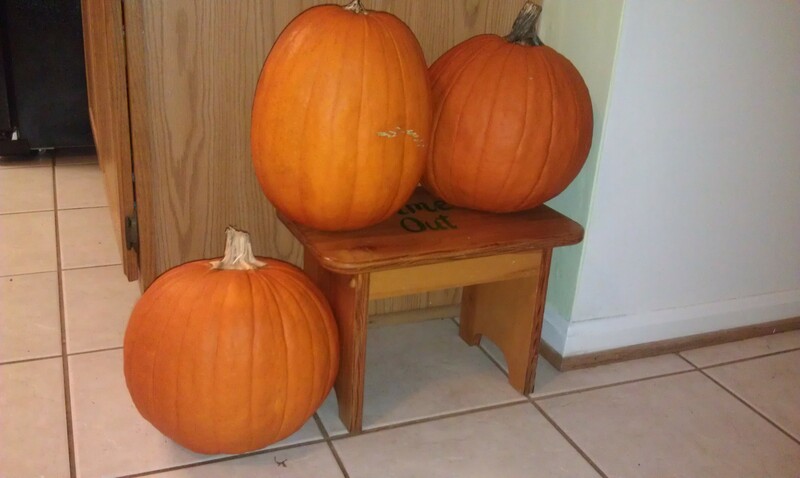 Now that Halloween and Thanksgiving are behind us, the pumpkins have to leave the front porch. We always buy a few pumpkins every year for decoration and usually one to carve. These pumpkins are the ones you’ll see at Walmart and Aldi’s around here for $3 – $3.96 each. You’d pay about $17 each for these guys at the pick your own farms around here, which is why Walmart and Aldi’s get my pumpkin business. Normally, the old pumpkins get tossed in my garden to compost and the seeds regrow into pumpkin plants the following summer. And then the bugs eat my pumpkin’s vines. This year, I wanted to try something new to try to get my money’s worth out of these pumpkins. It took hours and hours, but I made 12 cups of pumpkin puree and 8 jars/containers worth of pumpkin butter. 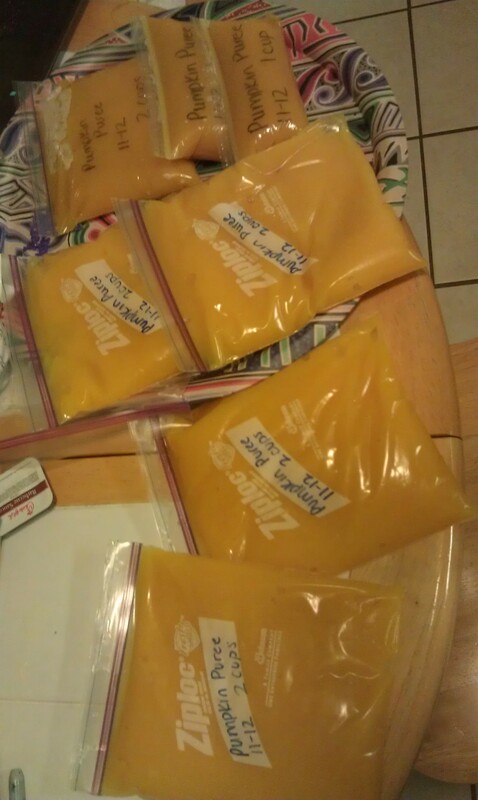 Making pumpkin puree (or butter) really isn’t difficult, just time consuming. You should definitely give it a try instead of tossing your old pumpkins! Canned pumpkin at the store is pretty pricey, so this is quite the savings. I started with 3 large carving pumpkins. For best results, you’ll want to use a pie/sugar pumpkin, which are smaller and sweeter, but they are also much more expensive. My goal was to use up the pumpkins we already had, so I used the carving pumpkins. The taste isn’t quite the same, but it’s not bad. 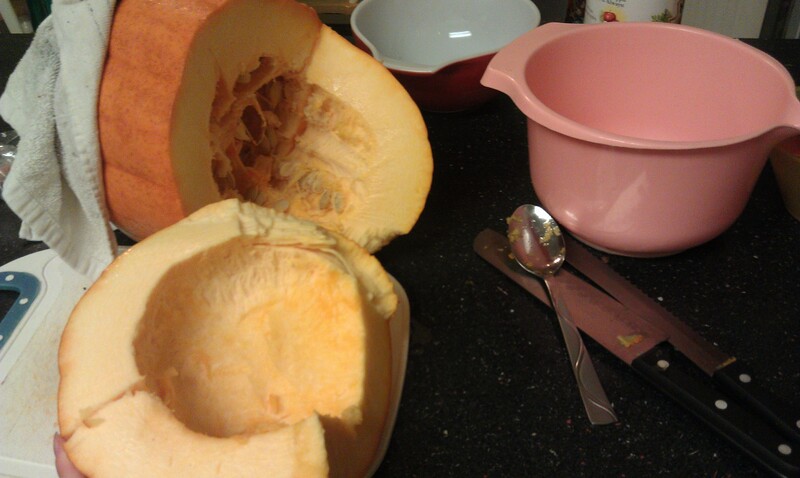 I rinsed each pumpkin off with water and then chopped them up into large chunks. Make sure you scrape out all the gunk and seeds. You can save the seeds for your garden or toast them later. 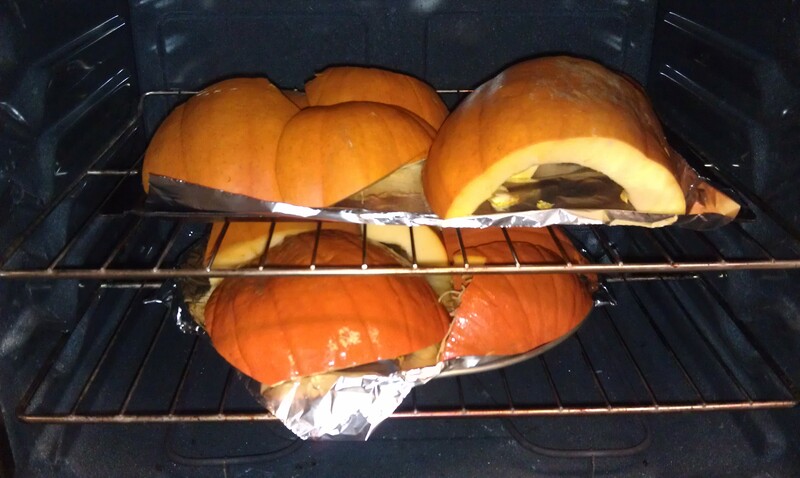 Place your pumpkin chunks (skin and all) on a greased baking sheet. Skin side up. I could get 2 pans in my oven at a time. I think I ended up baking 7 pans worth of pumpkin. Bake each pan for about an hour on 375 degrees. You want the pumpkin meat to be soft enough to be scoopable with a spoon. Scoop out the pumpkin meat and sit it aside. The meat should easily separate from the skin. Compost the skins. 7. 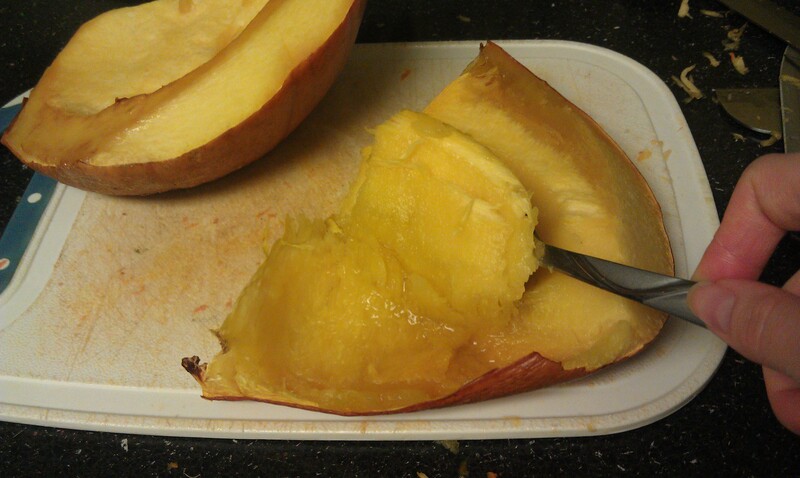 Once you have a bowl of pumpkin meat, blend it to make a nice puree. I used my Magic Bullet because I didn’t feel like getting out my blender and I couldn’t find my food processor. 8.Once it’s blended, you have pumpkin puree! 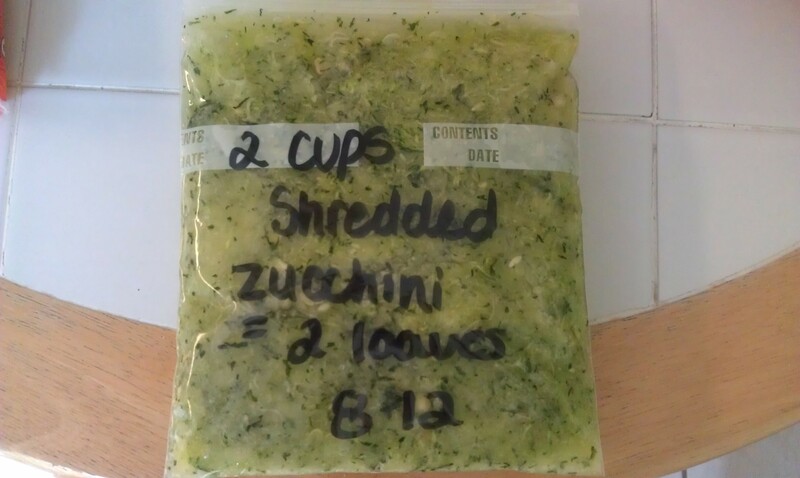 I measured mine in 1-2 cup portions and put them in freezer bags to use for recipes later. 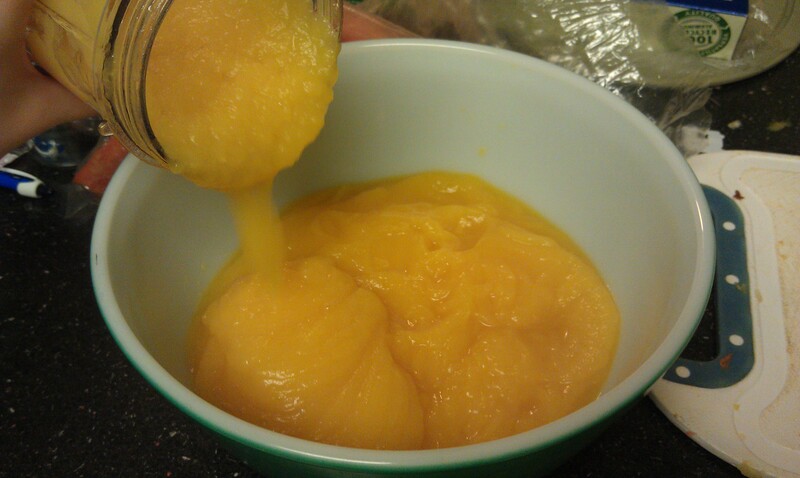 Add sugar (I had about 14 cups of puree, and added 6-7 cups of sugar). Many recipes that I saw called for a 1:1 ratio of pumpkin- sugar, but I wasn’t doing that! Cook on low overnight with the lid propped open! You need the steam to be able to escape so that the butter can reduce down. I prop my lid with wooden spoons. In the morning, give it a stir and put it on high to finish it up. Add more sugar or spices if you want. 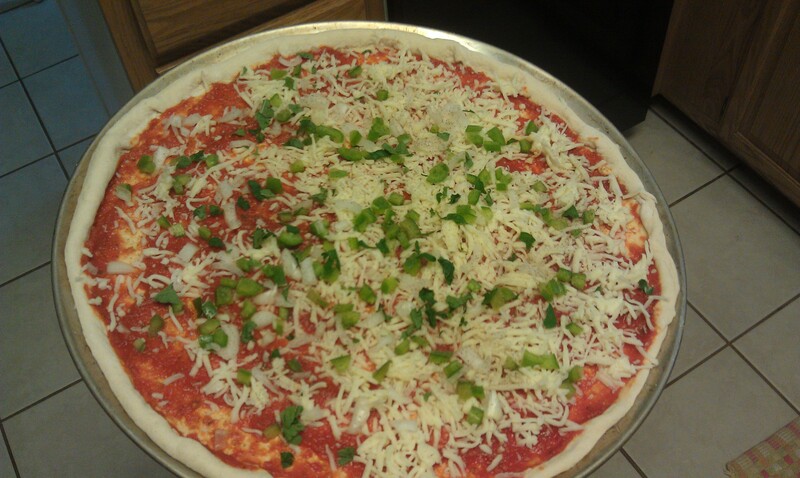 There’s no strict recipe, just keep adding until you get the taste you want. The butter should be thick and dark. When you’re ready, turn the crockpot off and fill your jars or containers with the butter. You CAN NOT can pumpkin butter as it is too dense and not acidic. Your butter can be stored in the fridge for a few weeks or frozen. It is not shelf stable. So there you go! It’s really not hard work to make your own puree and butter. Give it a try before you throw away your pumpkins next time! And let me know if you have questions! 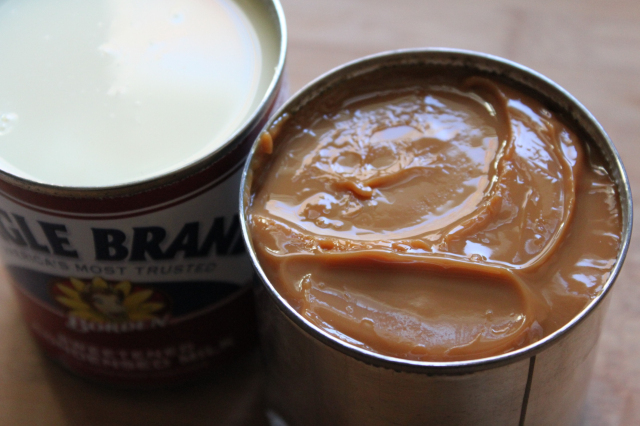 Easy Homemade Caramel or Dulce de Leche from Sweetened Condensed Milk! We just got a new coupon for $0.50 off any Eagle Brand Sweetened Condensed Milk, I hope you printed it! This coupon, paired with doubles and a sale should make for some very inexpensive condensed milk. So what can we do with all of it?! There’s a very, very delicious “recipe” for homemade caramel out there and the only ingredient is Sweetened Condensed Milk! There are a few ways to make it, so take your pick. First way, bring a large pot of water to a boil. Add the entire can of Sweetened Condensed Milk. The whole can, unopened, no holes, just the can. Make sure it is covered with a layer of water at all times. 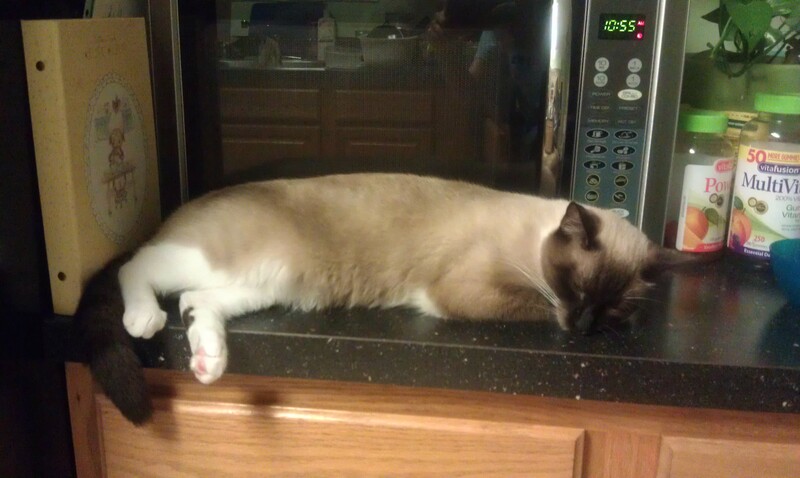 Lightly boil for 3-4 hours. You will probably have to add more boiling water to keep the can covered, so I would have another pot or tea kettle ready. 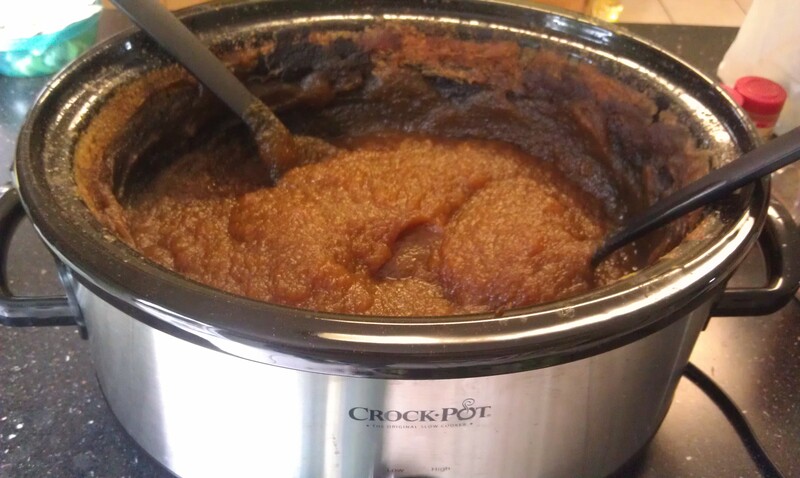 Second way, fill your crock pot with water and submerge the can of Sweetened Condensed Milk. Set on Low for 8 hours. 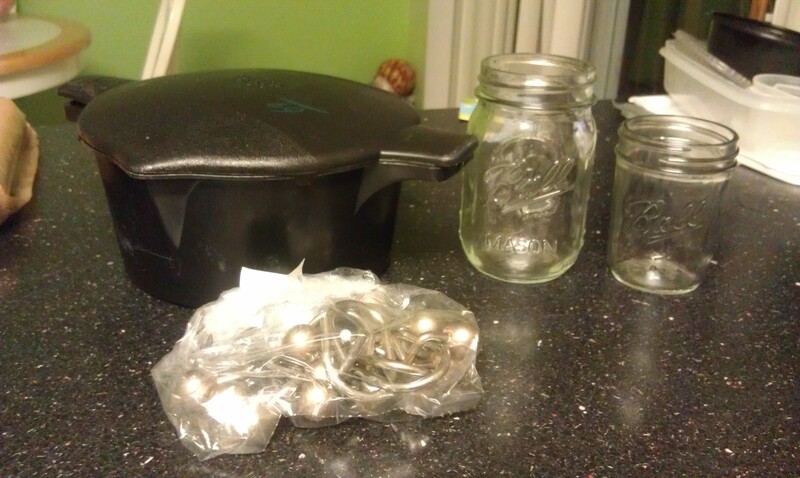 When the time is up for either way, remove from water (Jar Lifters for canning work perfect) and sit aside to cool. Do NOT open the jar until it has reached room temperature or it will explode on you. Third way, pour the Sweetened Condensed Milk into a double boiler and cook that way for about 2 hours. Fourth way, create a “double boiler” method in your oven. See exact recipe below at the Eagle Brand website. And then voila! 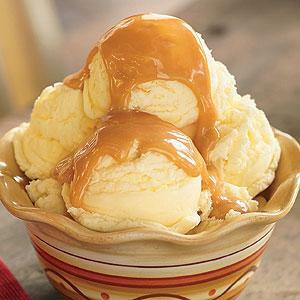 Beautiful “caramel”, also known as dulce de leche. It’s perfect for dipping fruits or ice cream topping. You can store leftovers in the fridge for quite some time. You can make a double batch and don’t open one can – it’ll last in the fridge sealed for months. Now, I know someone of you will have something to say about the BPA in the can. By all means, I’m not expert of metal chemicals, but I have to address this because I’ll get nasty comments and emails about me killing my family with this caramel. Apparently, BPA doesn’t melt until a certain temperature which may not be reached while boiling the can, while BPA still leeches itself to food anyway the boiling may not cause too much of a difference. BUT if you’re concerned, open the sweetend condensed milk before boiling and dump it into a glass canning jar, place a lid on it, and can it like you would normally. I don’t know how long this method takes. I assume you could put it in the pot like in the first idea for 3-4 hours, but it might not take that long. Or just use method 3 and 4 since you don’t cook in the can with those steps. So there it is! Super easy, super delicious! Print the $0.50 off any Eagle Brand Sweetened Condensed Milk coupon and pick it up next time you’re out! https://i2.wp.com/savvywifehappylife.com/wp-content/uploads/2012/11/eagle-brand-caramel.jpg?fit=300%2C300&ssl=1 300 300 Brandi https://savvywifehappylife.com/wp-content/uploads/2016/09/SavvyWifeHappyLife-logo-2.png Brandi2012-11-05 11:36:182012-11-05 11:36:18Easy Homemade Caramel or Dulce de Leche from Sweetened Condensed Milk! It was a slow week around here, but I bought something so I ought to share! I went to the flea market last weekend, but there was nothing good. We left with nada! 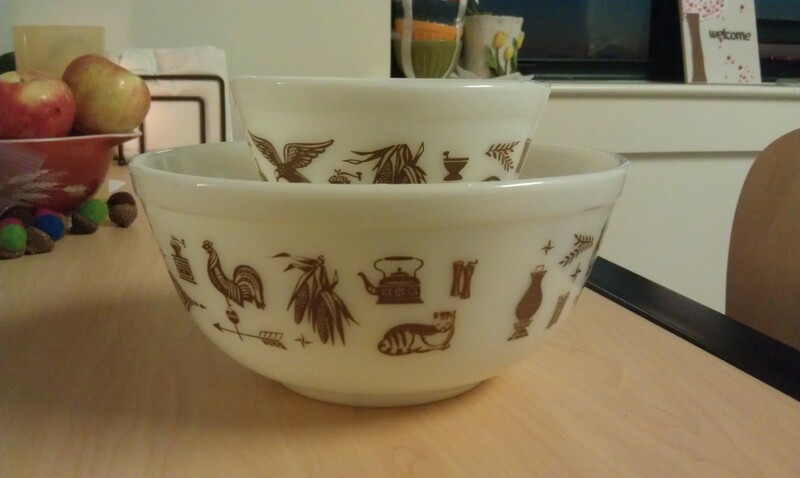 I went to Value Village on Monday (25% off day) and found some Pyrex to buy! Unfortunately, it is the Early American pattern, which is one of my least favorites. I bough the 401 (the tiny bowl) because as I mentioned last week when I bought the other ugly brown 401, they are great for cereal/soup bowls! I collect cheap extras because one day I’ll have enough to stack them up in my cabinet and use them every single day. Maybe I’ll even have one 401 from every pattern 🙂 I felt really bad leaving the other bowl behind… after all, I was taking its “baby”! 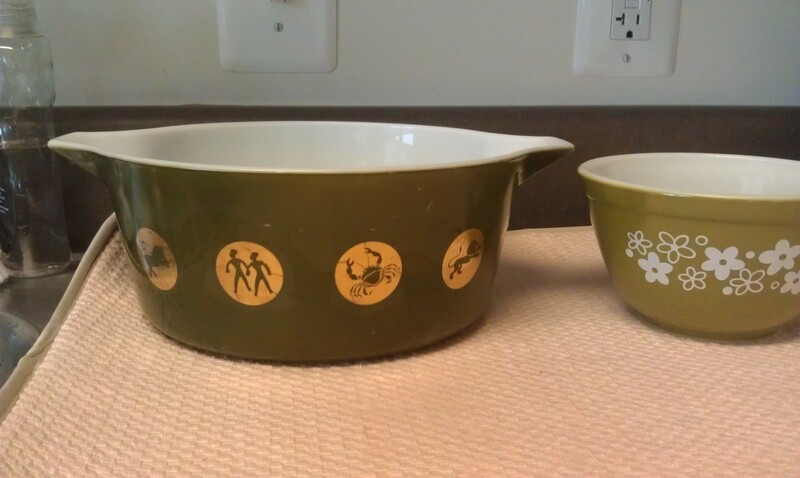 Luckily, my Pyrex pal said she wanted it via text so I bought it. The two bowls set me back $4.40 after discount and tax. Not shabby! Nerdboy found these mini coke classes and thought they were pretty neat! 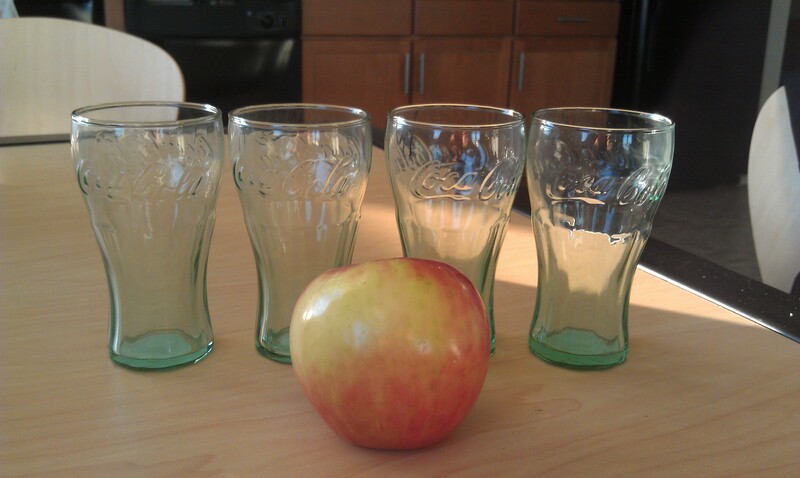 (The apple is for size comparison, we didn’t buy an apple at Value Village). They aren’t antiques, but they are cute little things. Michael NEVER buys, let alone looks, while we go thrifting so I have to support his buys! The were $0.49 each + 25% off, plus still had the original stickers on the bottom. 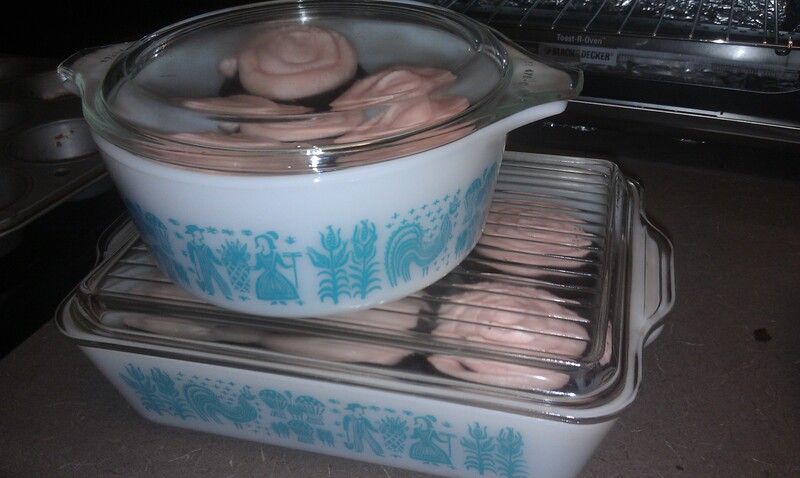 I’m sure some of you wonder if I actually use all this Pyrex I buy, right? 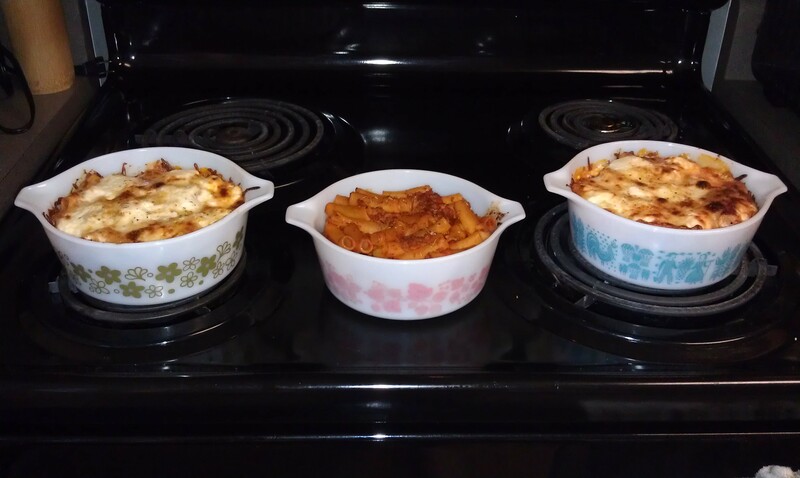 Well, we do use Pyrex almost every day! I love the 401 bowls, they are probably my favorite size dish. 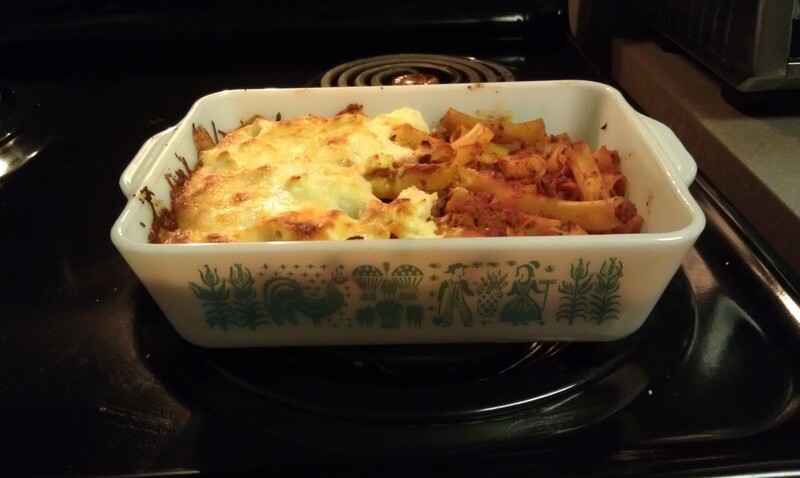 We use the refrigerator dishes for leftovers and just last night, we each cooked and ate our own baked ziti in cute 472-sized casseroles. Did you have a better thrifting week than I did? Have any questions? Don’t be shy! https://i1.wp.com/savvywifehappylife.com/wp-content/uploads/2012/10/2012-10-12-19.43.50.jpg?fit=3264%2C1952&ssl=1 1952 3264 Brandi https://savvywifehappylife.com/wp-content/uploads/2016/09/SavvyWifeHappyLife-logo-2.png Brandi2012-10-14 02:31:252012-10-14 02:34:24An Apple a Day Keeps the Doctor Away! 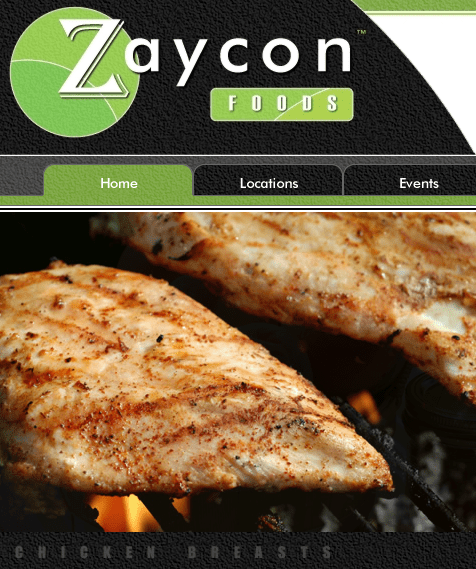 *HOT* Zaycon: $1.69/lb Chicken -Ordering Starts Now! Yahooo! Zaycon has opened up ordering for this year! The price is $1.69/lb, which is a stellar price on boneless chicken breasts! https://savvywifehappylife.com/wp-content/uploads/2016/09/SavvyWifeHappyLife-logo-2.png 0 0 Brandi https://savvywifehappylife.com/wp-content/uploads/2016/09/SavvyWifeHappyLife-logo-2.png Brandi2012-09-15 19:51:522012-09-15 19:53:37*HOT* Zaycon: $1.69/lb Chicken -Ordering Starts Now! Frugal Tip: What to do when you have 7 million zucchinis?! Unfortunately the bugs destroyed my zucchini plants and left me with a very short growing time and only a few zucchini. But between the zucchini I picked from my garden and the few I picked up at the farmer’s market, I still have enough frozen zucchini bread and shredded zucchini to last us until next summer 🙂 If you have too much summer produce to handle -freeze it! 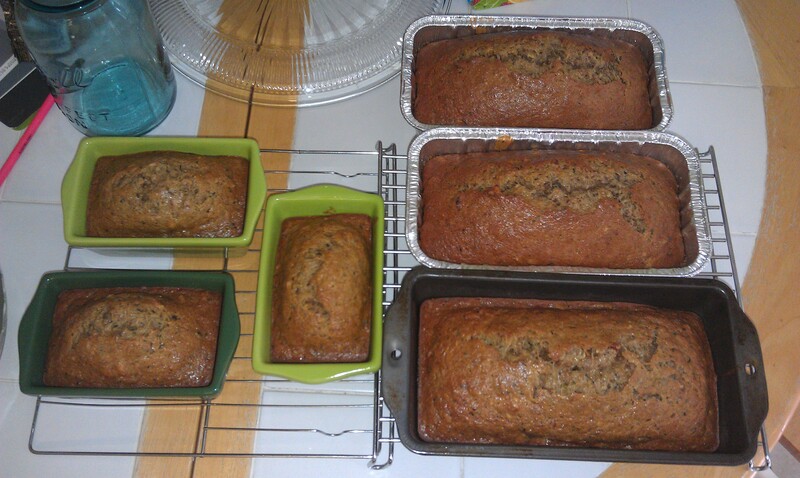 I made many batches of zucchini bread this summer. We always ate a loaf or two, and then I’d wrap up and freeze the other loaves. 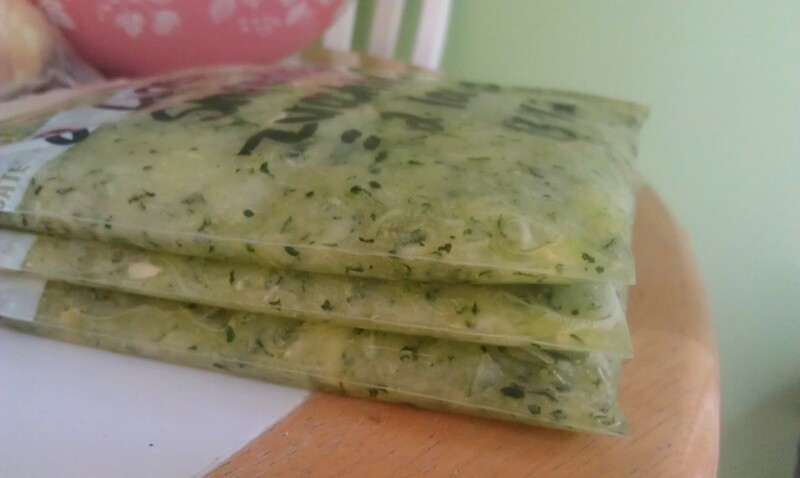 If I wasn’t feeling up to making bread, I would simply shred the zucchini, measure it based on the recipe I follow, and then freeze it up in portioned baggies! This January when we’re craving some fresh summer zucchini bread, I’ll be able to pull out my shredded zucchini and whip up a loaf or two! If you want to be frugal, you must never let produce go to waste. It can almost always be cooked, frozen, dehydrated, or canned for a later day! https://i2.wp.com/savvywifehappylife.com/wp-content/uploads/2012/09/2012-08-02-13.58.52.jpg?fit=3264%2C1952&ssl=1 1952 3264 Brandi https://savvywifehappylife.com/wp-content/uploads/2016/09/SavvyWifeHappyLife-logo-2.png Brandi2012-09-03 00:03:512012-09-03 00:03:51Frugal Tip: What to do when you have 7 million zucchinis?! It’s been awhile since our last thrifty post! If you’ve been following along, you know that we moved into a new apartment this week and the first day of classes was today! I’ve been very busy but hopefully I’ll be settled and on a schedule soon. Here are my thrifty finds from the last 2 or 3 weeks! My mom has told some of her friends that I collect Pyrex and I’ve been receiving a few pieces from them! It’s nice to have other flea market-go’ers and yardsaler’s looking out for you. 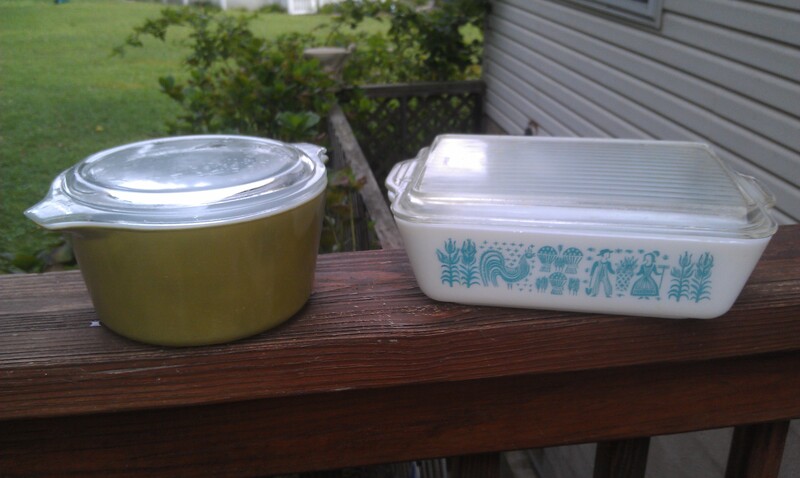 The Shenandoah casserole dish (the yellow one) and the Opal pie plate were from my mom’s friend. They were only $1 or $2 each! That same week, I went to the flea market and found those two cinderella bowls in the picture above. 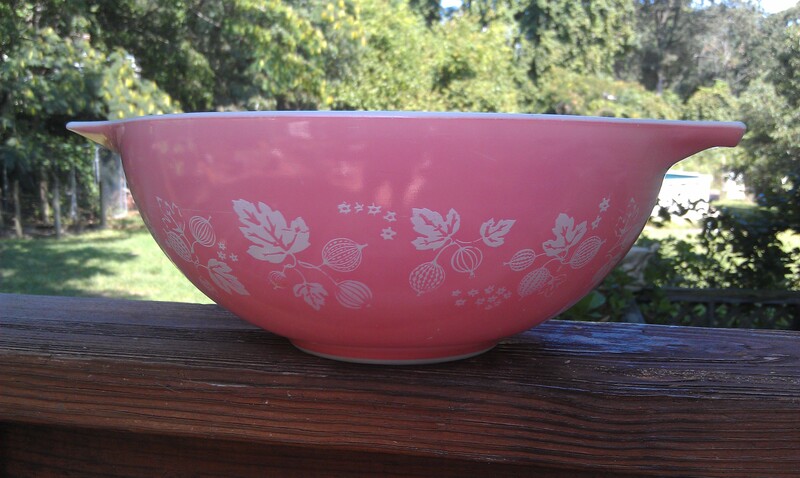 I saw the White Spring Blossoms bowl first and then Pink Gooseberry bowl sitting next to it. I got SO excited to see that pink one -it’s big and gorgeous! Trying to hide my excitement, I asked the man his prices and he said $1 for the white and $2 for the pink -SCORE! That same week I saw that same pink one for $10 and had a hard time passing it up -good thing I did! Pink Gooseberry is extremely popular. The next morning at the flea market, I found these 2 lovelies! I think I got the green casserole dish for $1.50. it came with a lid, so that’s always a plus for me! I’ll spend $1 on spare lids, so $1.50 for the dish and lid was great with me. 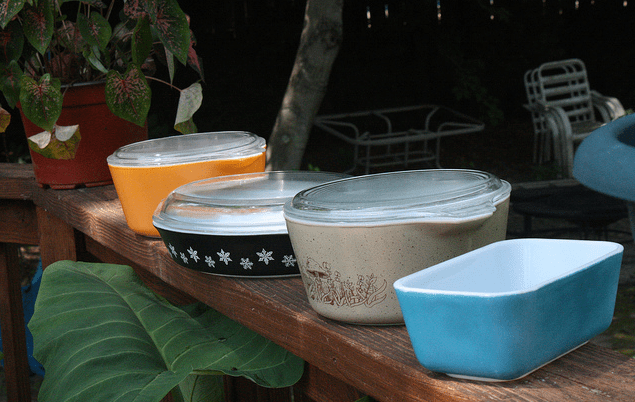 To the right you’ll see when of my latest and most favorite finds -a refrigerator dish with lid! I couldn’t believe my eyes when I saw the Butterprint dish laying all out in the open on the table. I immediately scooped it into my arms and asked the price before even looking at its condition (it didn’t matter to me!). The lady said $1 -Yipee!!! My first refrigerator dish with a lid for $1 -amazing 🙂 After further investigation, I noticed the lid is chipped, but it doesn’t bother me. I’m slowly adding to my turquoise Butterprint collection (all at amazing prices!). I complained for months because I couldn’t find a single fridgie, but just in 2 weeks, I found 4! Imagine my surprise when I found both of these this week in my own cupboard (on different days)! 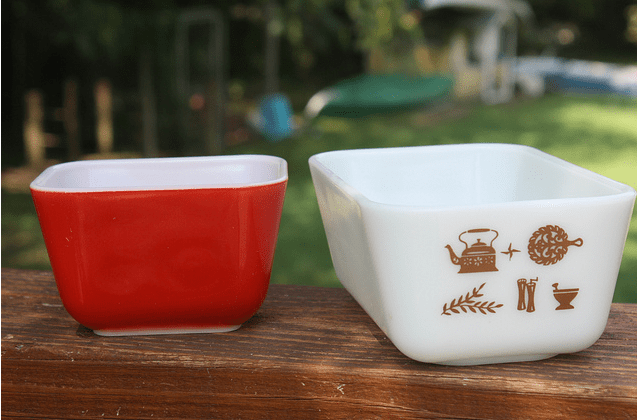 I must have bought the red one at the Goodwill years ago when I was still eyeing Pyrex up. My mom said the Early American (the white one) was probably from my great aunt. Not necessarily thrifts since I found them in my cupboard, but lovely nonetheless! 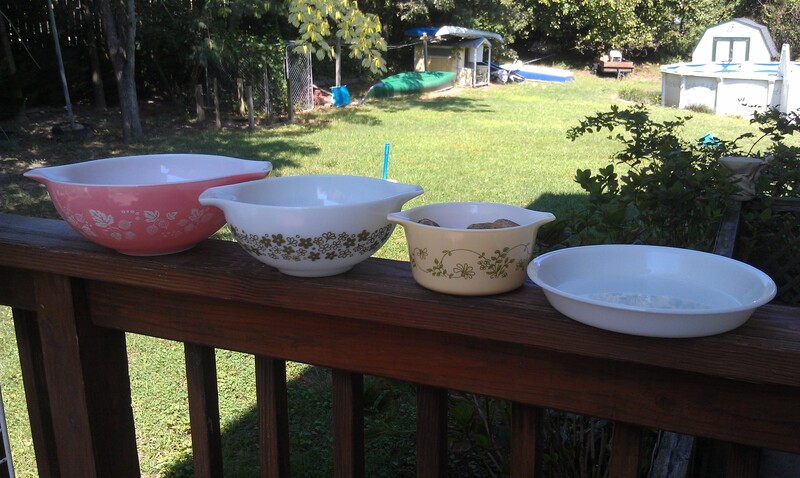 That following week, my mom’s friend brought another batch of his Pyrex finds. All pieces were $1-$2. The blue one up front makes fridgie #4! I’ll hopefully be trading the Forest Fancies casserole (mushroom pattern) with a fellow Pyrex collecting friend as it is not one of my favorite patterns. The black snowflake is awesome and definitely a great find! The orange casserole dish is lovely as well, but is unfortunately missing its original lid. At least it has a lid! To end the summer of right, my fellow thrifting buddies and I went to 3 Goodwills, Value Village, and our local thrift shop to hunt out some deals. While none of us walked away with any Pyrex, I scored a few goodies! The canning jars were bought for $0.25 and $0.50 each. The Pampered Chef steamer was a steal at $0.69! I wanted one for the apartment anyway so paying less than $1 made me smile. That thing cooks broccoli perfectly! In the baggy are the shower hooks I got for $0.99. We needed shower hooks and these were exactly the kind I was looking for! 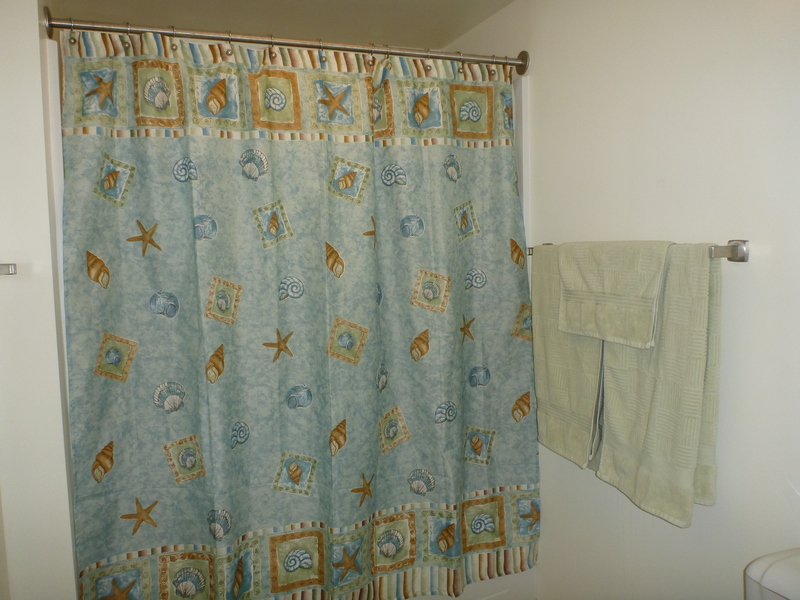 The shower hooks are perfect! The day after moving in, Nerdboy was nice enough to take me to our local Value Village. They had quite a few pieces of Pyrex but they were a bit overpriced and not my patterns. I did find this promotional piece called Zodiac for my friend, Glenda who has been wanting it! It was $3. The little flower bowl is my cereal bowl that I got early this summer. Whew -I think that’s everything! I’ve had a great few weeks of thrifting. How about you? Any deals?! New Fleischmann’s Yeast Coupons to Print! If you make your own bread and pizza dough, you’ll love these new coupons! I love making my own bread, bagels, pizza dough, etc. -it’s amazing! You’ll also be able to find recipes that you don’t even need a bread machine for. But you will need yeast, which makes these coupons come in handy! This is the brand I use, so hopefully we can score cheap yeast after doubles since yeast is inexpensive anyway. https://i2.wp.com/savvywifehappylife.com/wp-content/uploads/2012/08/2012-06-13-18.45.59.jpg?fit=3264%2C1952&ssl=1 1952 3264 Brandi https://savvywifehappylife.com/wp-content/uploads/2016/09/SavvyWifeHappyLife-logo-2.png Brandi2012-08-27 11:34:082012-08-27 12:05:49New Fleischmann's Yeast Coupons to Print! 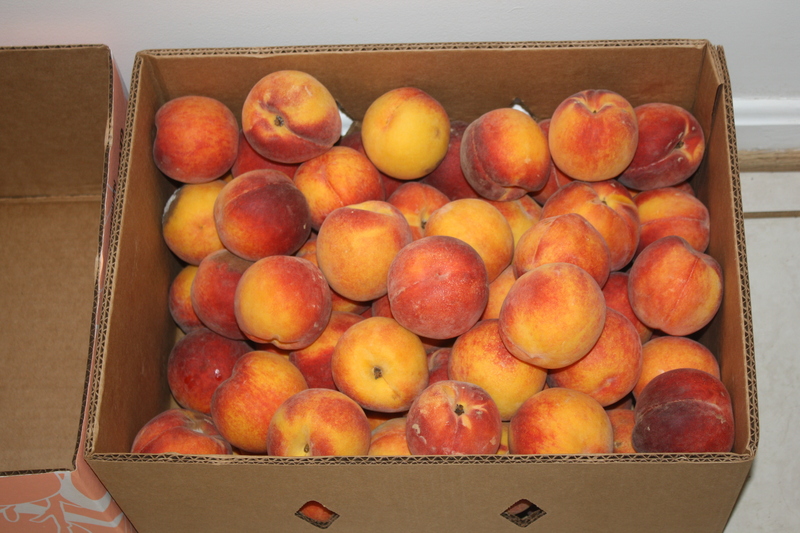 Two weekends ago, Nerdboy and I were out of town and stopped at a candy store/farmer’s market (basically the best store combination you’ll find) and found a big ‘ol box of peaches for $21.50. Each box was 25lbs, which makes the peaches just $0.86/lb. Depending on where you live, of course, that’s a pretty stellar deal! A good price for peaches from the grocery store is around $1.29/lb here. And at the Pick-your-own farms, it ranges from $1.20 – $1.99/lb. $0.86 is the cheapest I’ve ever seen and they are local peaches, so we bought a box. We were planning on picking peaches while heading to the beach this coming weekend, but this was quite a money saver and I couldn’t pass it up. So what do you do with 25lbs of peaches? Can them of course! Peaches only last a few days and then the eewie-gooey mold and squishiness starts spreading. I gathered up the rest of my jars, some more ingredients, and started canning! It took me about 2 nights to can them all, but I am a very slow canner… and I made 5 different types, so that’s a recipe for each of them… and if you know me, you know I hate following recipes. I took things one at a time and only did 2-3 quarts at once because as many of you recall, I HATE quarts. Big, heavy, tall, hot, etc. Canning peaches in a sugar syrup is the easiest! Now the peaches are ready to be enjoyed straight from the jar, or dumped into a cobbler this fall/winter/spring-yum! You gotta love having “fresh” peaches when it’s snowing Maryland! Nerdboy wanted some peach-mango jam, so we followed a recipe and ended up with 2 jars of jam -TWO! 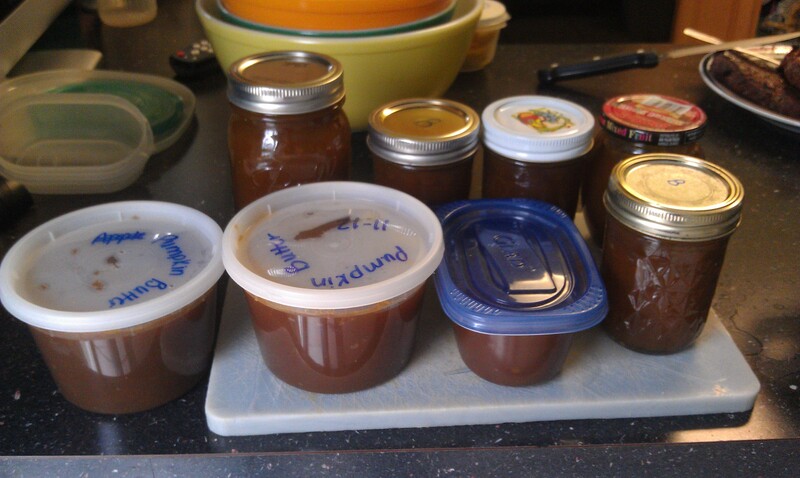 The recipe didn’t state how much it made, but I didn’t think that all those peaches would only make 2 jars of jam. He’s a very spoiled boy. I also gave peach salsa a try. I L-O-V-E fresh salsa and figured peaches might be a fun addition. I’m not really a fan of it, but it’s alright, especially for topping chicken. It was SO pretty before it got all cooked up though. 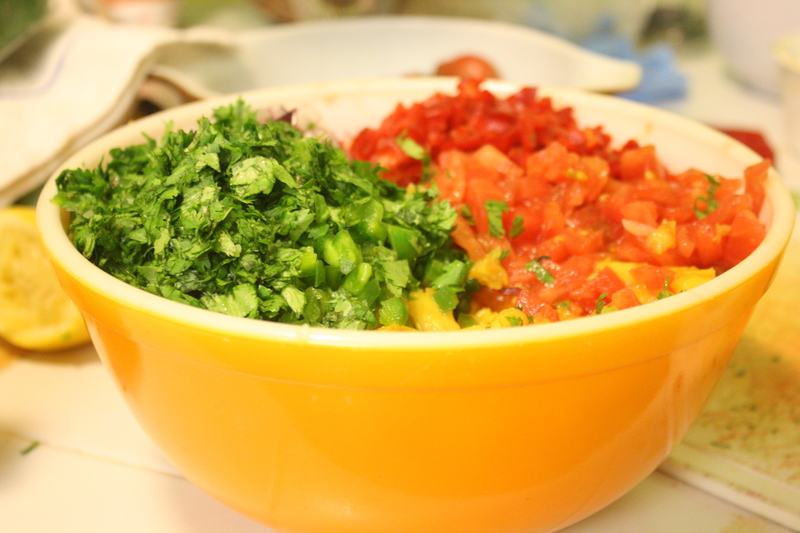 Tomatoes, peaches, red onion, cilantro, red pepper, jalepenos, -oh my! I used the rest of the peaches for plain peach jam! 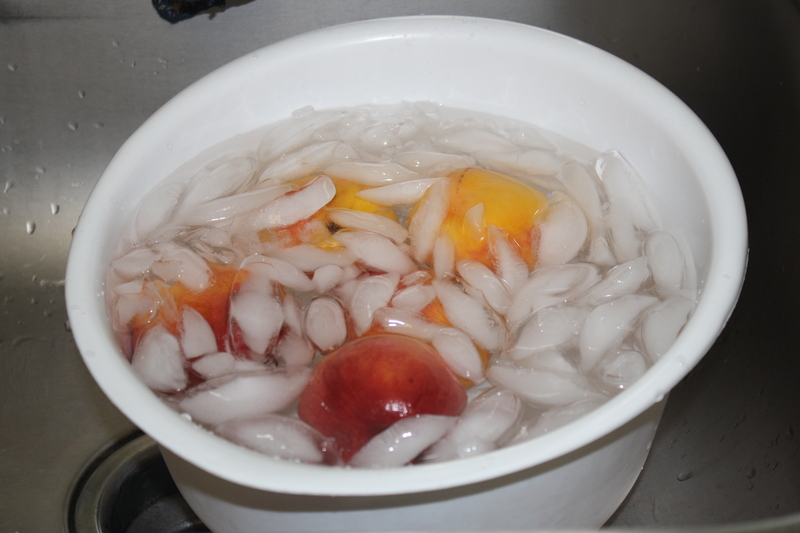 ~After their hot bath, drop the peaches in a bowl of ice water. This should help the skins peel off a lot easier! 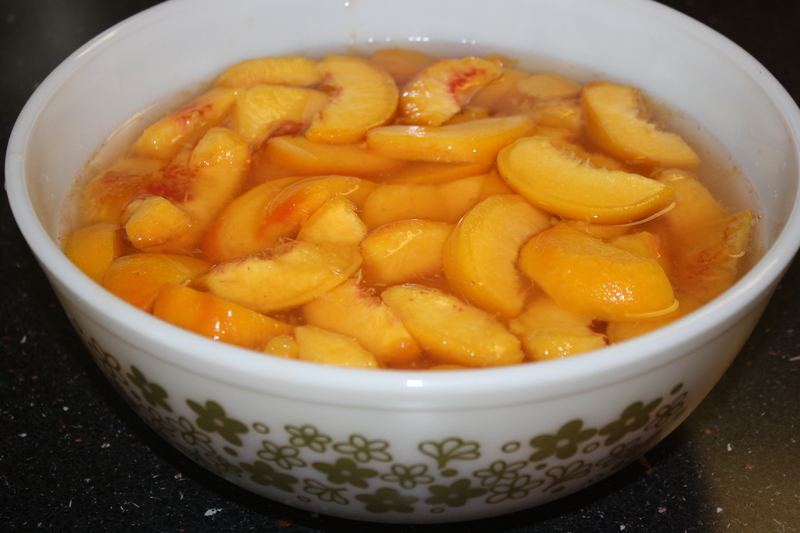 ~After peeling the peaches, cut them into the size you need and soak them in a water+lemon juice bath. You can also buy the acid fruit powder stuff from the store (made by Ball). It’s just to keep the peaches from going brown. I cut these peaches into slices for peach pie/cobbler filling. ~Then, follow the directions for what you’re making. 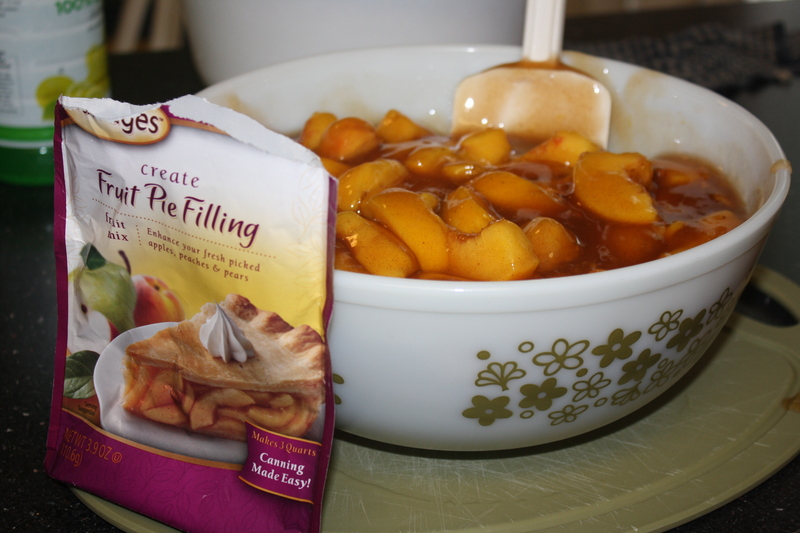 This batch, for instance, was for spiced pie filling so I followed the directions on the package. For the normal canned peaches, you’ll dissolve sugar and water (I did 2 parts water, 1 part sugar) on the stove and pour over the peaches. 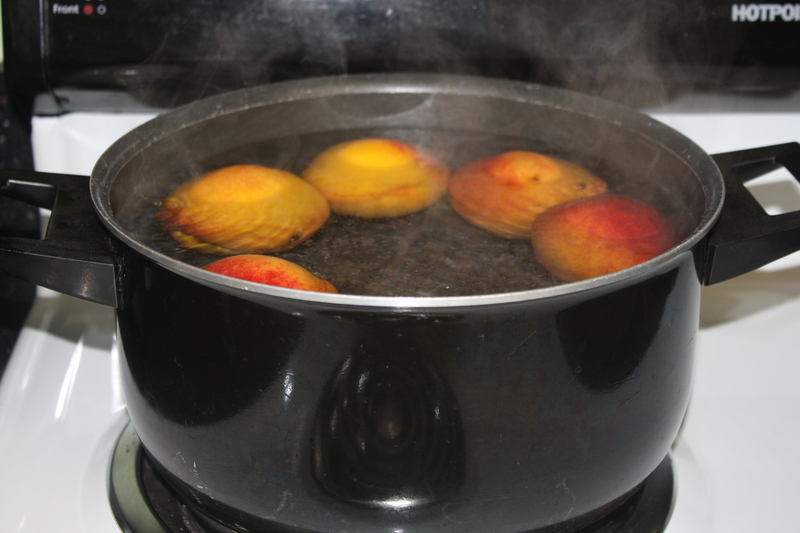 For peach jam, you’ll want to follow a reliable recipe. You’ll need sugar and pectin. ~Above shows all the goodness that went into the peach salsa recipe I found on Pinterest. Gorgeous! ~And that’s everything -whew! 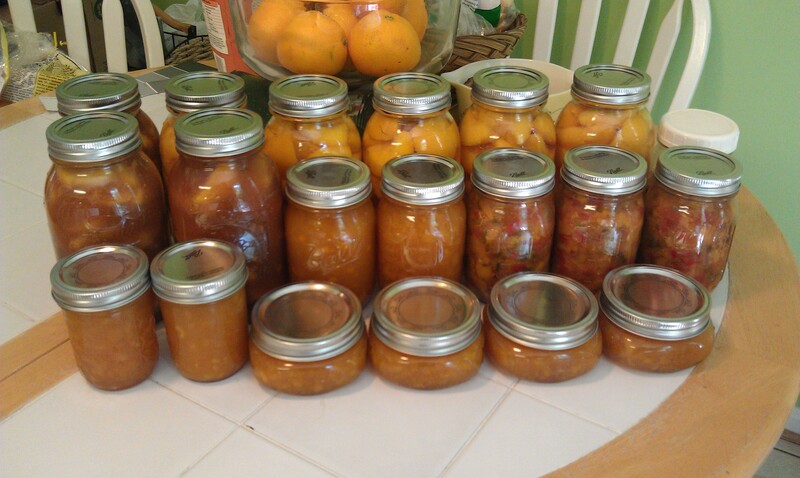 I ended up with 5 quarts of canned peaches in sugar, 3 quarts of spiced pie filling, 2 jars of peach-mango jam, 4 pints of peach salsa, and 6 half pints for peach jam + more in the fridge. That’s 20 jars of peach products! I paid $21.50 for all the peaches, so not including the sugar, that’s just over $1/jar. That’s just about as frugal and homemade as it gets!